Home » Regional Cinema » Vikram just imitated Ilayathalapathy Vijay in Thuppakki to perfection! 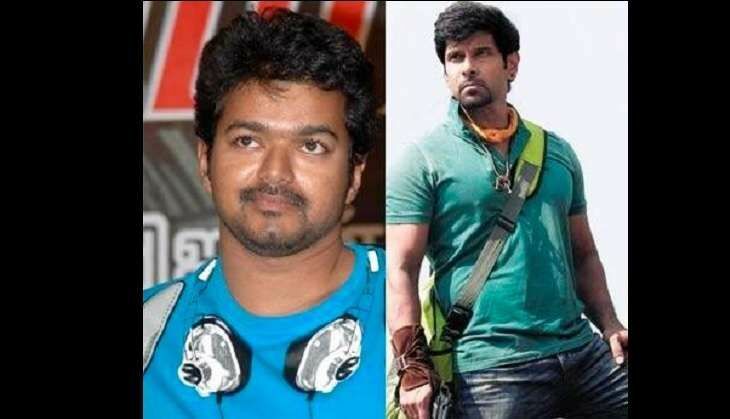 Vikram just imitated Ilayathalapathy Vijay in Thuppakki to perfection! Chiyaan Vikram's recent sci-fi thriller, Iru Mugan, has been declared a hit at the Chennai Box Office. The film, which hit the screens on 8 September, has minted Rs 5 crore at the Chennai Box Office. The success of Iru Mugan has come as a huge relief for the national-award-winning-actor as his last film, 10 Endrakulla, was a disaster at the ticket window. Ahead of the release of Iru Mugan, Vikram undertook a promotional event marathon in Kerala and Andhra Pradesh. During a promotional event in Kerala, fans of the actor asked him to dance to a song. Vikram obliged and asked the organisers to play an Ilayathalapathy Vijay dance number. At the same event, when he was asked if he would act in a Malayalam film soon, Vikram's reply drew thunderous applause? Why? Because he delivered Vijay's popular dialogue from Thuppakki - "I'm waiting" - in the style that the actor had popularised.